WOOD YOU PLAY IT? 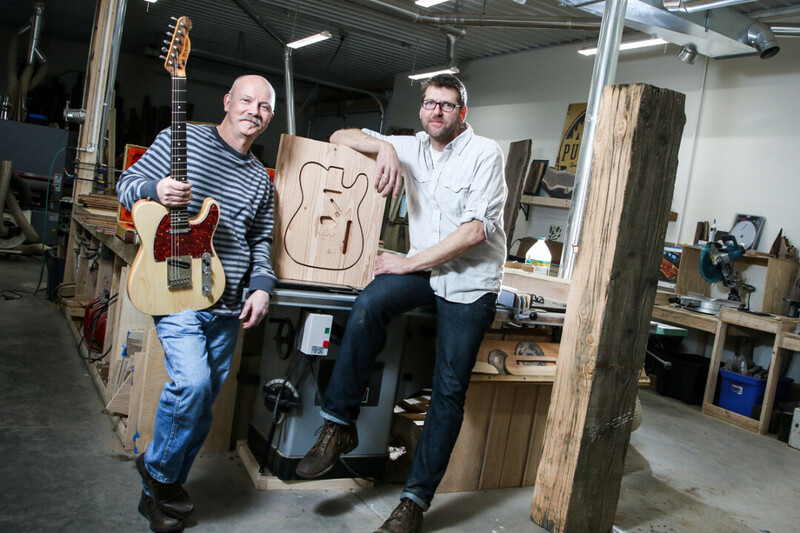 Acclaimed local guitar maker Gordy Bischoff has teamed up with Tim Brudnicki – a woodworker specializing in reclaimed urban lumber – to form Eau Claire Guitar Works. A hundred years ago, the word local was presupposed in the way the world worked. Of course the beef was local. Of course that soap was locally made. By so many measurements the world was a smaller place. Now, after decades of trying to remember or relearn the ways in which local artisans and economies thrived, one of the most sincere paths to creative entrepreneurship may be as simple as friendship and collaboration. Talking to each other. Or maybe playing music. Case in point: the burgeoning Eau Claire Guitar Works. On an early April morning south of Eau Claire, Tim Brudnicki and Gordy Bischoff are seated in Brudnicki’s office just off the large workshop of his growingly ubiquitous Eau Claire Woodworks (recall the beautiful furniture and fine touches of the Oxbow Hotel and Lakely Restaurant, Fit Elite, Ambient Inks, and the Altoona Event Center). The two men are sipping strong coffee and the shorter, mustachioed Bischoff is maintaining a steady soliloquy of ideas quite apart from the easy silence that envelops Brudnicki, whose 6’4” frame leans back casually in his chair, like a taciturn school principal. The two men are a study of contrasts, but both successful artisans who met not all that long ago through the growing network of Eau Claire musicians and music-lovers. In this case, they may have also been pushed together by a neighborhood of doomed trees. Two or three years ago, Dan Rouse, owner of three Bischoff instruments, came to him with the notion of using native ash trees (harvested off Rouse’s southside property) for a guitar. The City of Eau Claire was cutting all the ash trees in Rouse’s neighborhood, and he just couldn’t stand to see all that wood go to waste. “I said to Gordy, ‘Fender Stratocaster and Fender Telecasters are made of southern swamp ash, and this Wisconsin white, green, and black ash is far superior, denser, nicer wood.’ ” Rouse had already separately talked to Brudnicki about potentially using the wood for custom furniture, but it was the guitar-making that intrigued all involved. 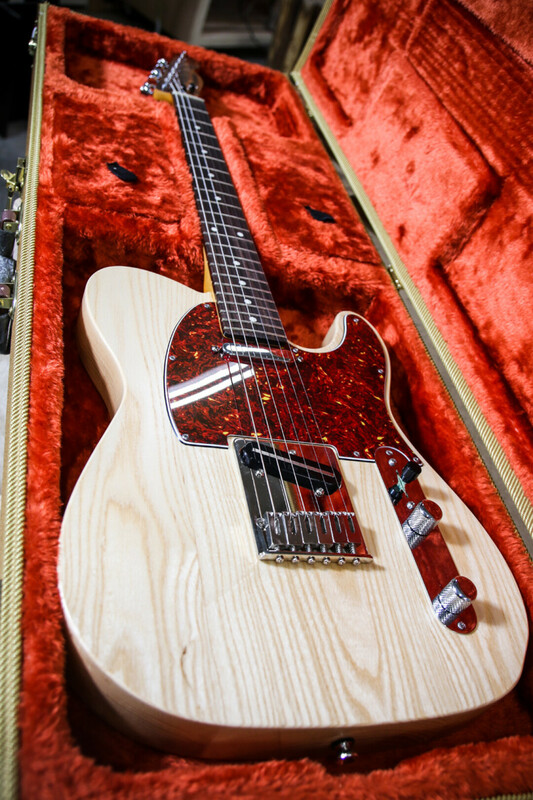 “Ash is a wood that has been historically used for solid-body guitars,” says Brudnicki. But unlike rosewood or mahogany, ash is local, and for better or worse, readily available due to the spread of the emerald ash borer, a beetle devastating the American ash population. Bischoff puts in, “…(I need) wood that is stable, dense enough to be resonant. Even though these are solid body guitars, they need to be dense enough to transmit the energy of the strings, rather than soak it up.” He pauses a moment before continuing, “What is stable and good for a cabinet is good for a guitar, too.” Brudnicki nods quietly in agreement. But between an Eau Claire city forester cutting a tree down and a customer carrying a velvet-lined case heavy with a new guitar, lay significant challenges: transportation of the wood, the milling, the drying, and the precision cutting of the body of the guitar. Years of time and investment. 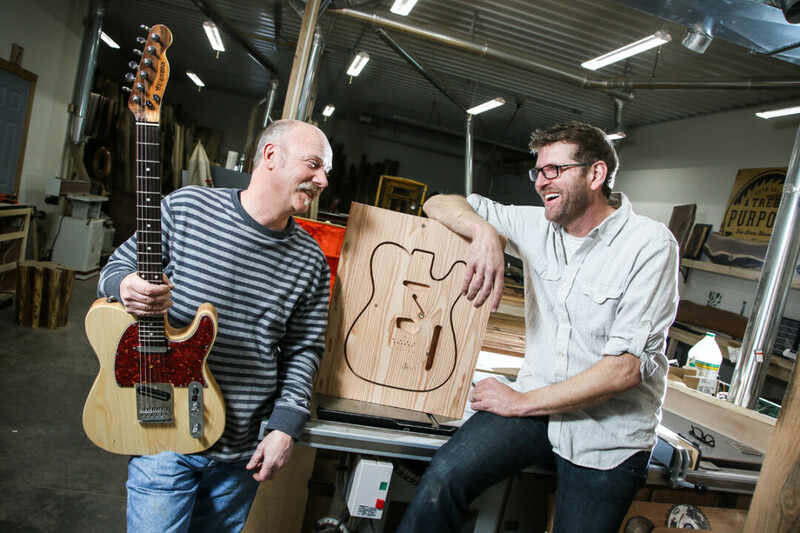 The first finished guitar (a beautiful prototype serial numbered TEL-000) will be unveiled on April 21, as part of an Eau Claire Regional Arts Center fundraiser for the Confluence Project in which tickets will be raffled off for $10 apiece. The guitar will be on display each week for the next several months at the Sounds Like Summer concert series, and also at the Eau Claire Woodworks and Visit Eau Claire booths this June at the Eaux Claires Music Festival. Dan Rouse will be Eau Claire Guitar Works’ first true customer when he purchases a guitar poetically made with ash off his own property. The guitars will cost approximately $2,000, and both Brudnicki and Bischoff are eager to begin taking orders (contact information for Eau Claire Guitar Works can be found on Facebook). Bischoff will work with each customer intimately installing only high-quality hardware and pickups. Brudnicki says of this project, “My work is what I have to offer to this community. Everybody has something to give. And it’s a cool thing to make another artist better, to help them.” As an example, he mentions working on local music producer Evan Middlesworth’s studio control desk. Bischoff interjects, “One of the coolest things that happens to me is listening to a customer of mine play on one of my instruments.” Tim relates a story of watching Gordy beam with pride as Willy Porter played one of his guitars. 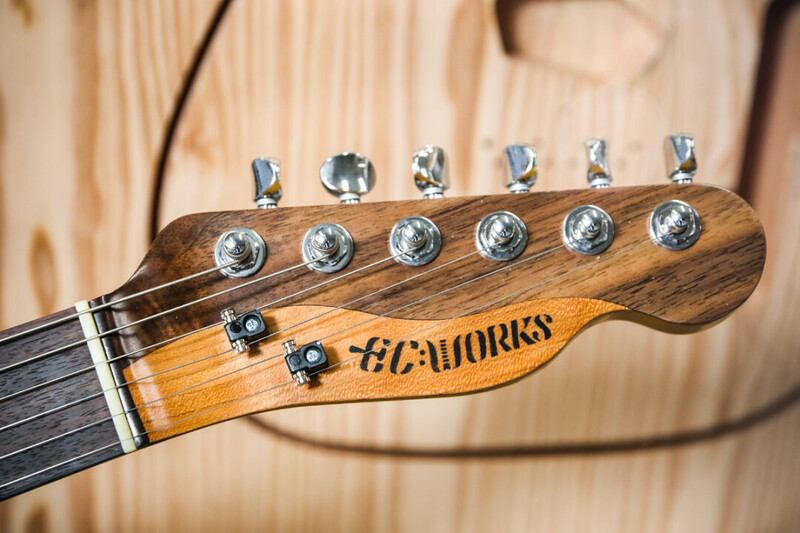 Eau Claire Guitar Works is a world-class collaboration between two renowned local artists, recycling high-quality local resources. With Brudnicki’s patient attention to form and quality, and Bischoff’s electric intensity and wealth of musical wisdom, each instrument is endowed with decades of human knowledge, channeled into a piece of wood that may have taken dozens and dozens of seasons to grow and flourish in the Chippewa Valley before its untimely end. So much of this collaboration is about timing: how humans find each other, how they befriend each other, which path they choose to walk in this life, when they choose to speak up, what they choose to save, and how. The good news is that sometimes, we find each other, find common ground, local ground, find the music in something as unsuspecting as a dying tree.